Spotlight on Spots - ChromaChecker complete solution. Big corporations - brand color critical - big requirements. We helped a Best Buy printer to quickly assess that they adhere to BestBuy Program. This tutorial demonstrates how ChromaChecker can facilitate the task. Whenever an output device is required to have a high level of accuracy to match another device, then a number of factors need to be considered to give you the highest quality possible. First, the substrate of the output device doing the simulation should have the lowest E-Factor possible, since paper is the fifth color in four color printing, if we can match the paper, then the profile does not have to work as hard to match the targeted device or reference printing condition. Use ChromaChecker substrate inspector to find the best E-Factor match substrate to your reference condition. Next you will need a high-quality ICC profile ideally with a large BtoA table. And lastly, you will need a high quality conversion to get them most accuracy out of the profile. Several variables can be optimized to create a high quality simulation profile. Ensure the substrate has the lowest E-Factor value simulating your "Reference Printing Condition." Ideally, you should use the best Match function in ChromaChecker Substrate Inspector to ensure your proofing substrate is within your E-Factor expectation for matching your targeted reference print condition that you are wanting to simulate. 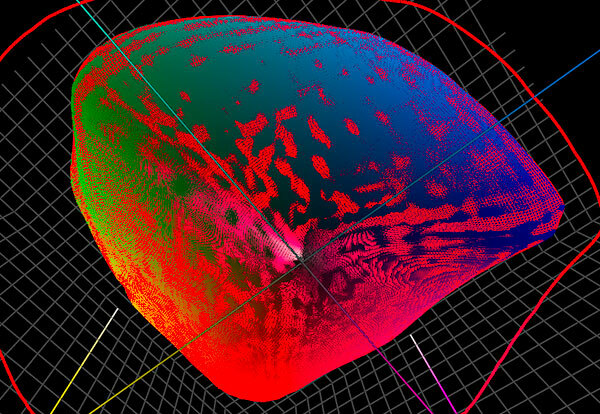 Ideally, it is better to match the actual color of the substrate you are simulating with your proofing substrate versus having the RIP add a dot simulation. 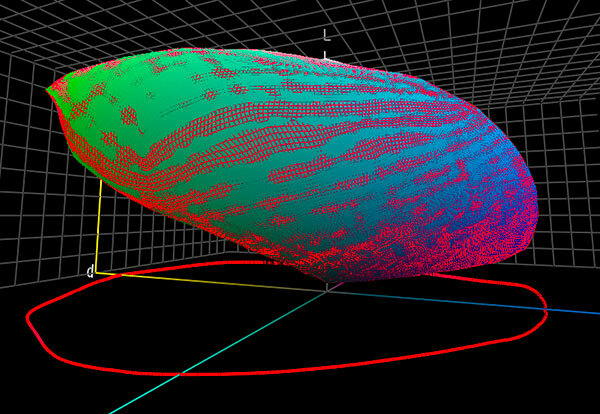 A dot simulation often will match in a light booth but will exhibit bad match in any other lighting condition. Check RH/T condition, ideally using ChromaChecker RH/T data logger. Dry air ( RH < 30%), or temperature out of recommended range (consult printer's manual for desired range) may cause variation in printed results greatly decreasing quality. Nozzle clogging tends to happen if temperature or humidity falls outside of desired range. This is a key benefit to utilize a ChromaChecker datalogger which will email the person responsible to the temperature and RH alerting them to out of specification conditions. 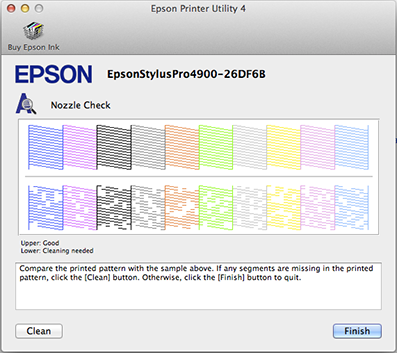 An example of printer utility software for checking nozzles. The same software enables head alignment testing. 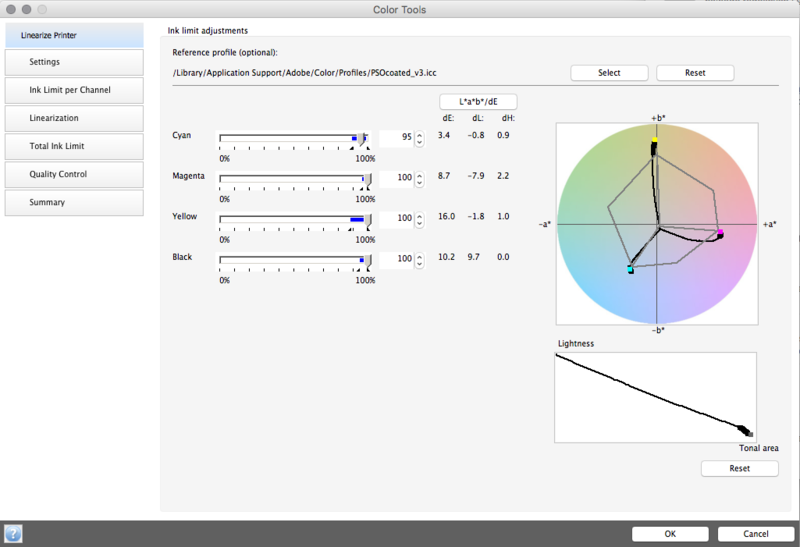 Use Instrument Inspector to evaluate if measuring device has an E-Factor relative to your desired E-Factor of color match. Ideally, the instrument E-Factor should be less than 20-25% of your desired workflow E-Factor. You don't want to use up more than 25% of your tolerance on instrument variations. There is a reason instruments have different pricing, it is due to precision, and the tighter the precision of your proofer match, the tighter precision for the instrument that is required. Inspect your instrument. Clean calibration white plaque and optical path. Be sure that ambient conditions are correct – temperature, for example, has a big influence on instrument measurements. Make some initial measurements just to warm-up the instrument. Linearize your printer if possible - consult RIP's user guide for details. If already linearized re-linearize it. If your goal is to optimally simulate desired print condition ( e.g. GRACoL2013_CRPC6 V2.icc ) adjust ink limits (ink restriction) to minimize Delta H.
ChromaChecker Print Inspector may be used for such analysis as well. 4. Qualify your Proofer Intra-Page (spatial uniformity) conformance. Print the ChromaChecker VI816 (11x17) target multiple times if larger print area within imaging area. Build a Qualification Track in Print Inspector for assessing the Proofers Spatial Uniformity. Import the measured targets, and group. If E-Factor of Intra-Page uniformity is 50% or more than your targeted accuracy to your Reference Print Condition, repair printer before proceeding to next step. If the printer is not consistent in imaging the same color builds on one page, you can't expect it to match your reference within desired E-Factor. Measure at least one of the VI816 targets twice, once after your normal delay to measure, and then measure the same target 3-4 hours later and name it in order to identify the later measurement condition. Use Print Inspector to Group the two measurements of the same target and ensure the variation between the two measurements is less than 10% of your desired E-Factor. If it is higher, you should continue measuring the same target until the difference is less than 10% of your desired E-Factor and remember this dry back period for all future measurements including your profile target. Compare all measurement to the baseline and observe how long time your substrate really needs to get a perfectly dried printout. For linearization and profile creation always use drying time from this analysis. 6. Define Profile test chart. Use as many patches as possible. For high precision proofers, 6000 patches can ensure noticeably better accuracy than 2000 patches. Adjust a size of the patch in a scanning direction. Most instruments in scanning mode measure each patch multiple times then calculates an average. The longer the patch size - the more times it is sampled and the more accurate the measurement. When using manual scanning measurement devices (e.g. i1 Pro) scanning at a slower speed will increase accuracy since each patch will be measured more times. For better patch recognition/accuracy, it is recommended to scramble patches as most instruments recognize them by contrast analysis. When using manual scanning measurement devices (e.g. i1 Pro) scanning at a slower speed will increase accuracy since each patch will be measured more times. Scanning devices should be set up for accuracy, not for speed (e.g. Barbieri LFP). Measure in a consistent speed and orientation. Some instruments have built-in an averaging option (e.g. i1iO, Barbieri LFP) - use it whenever is possible. If possible scan multiple tests charts several times and average the data. If building a Proofer profile, set the B to A table to the largest available size – that determines a size of the table. Analyze and compare profile after creation - perform a simulated conversion with your target color space to ensure the profile will support your E-Factor goals. Total ink coverage set based on the Linearization settings that were determined during total ink limit step. 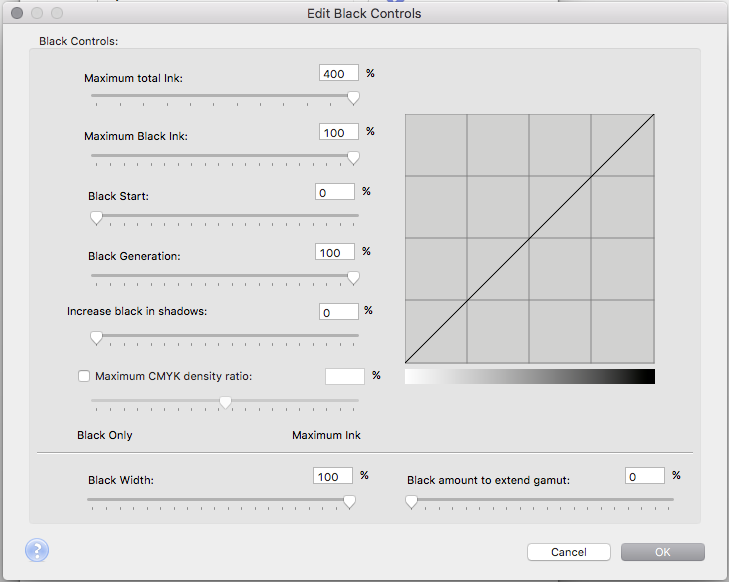 Black Generation – be careful, these settings can greatly influence the quality of the printed result. Research normal settings for your output device. Generally speaking, it is recommended to set black generation to reduce gray components - but it depends on how your printer prints black. If your printer utilizes Light light black + Light black + Black you may start black generation from zero and continue it up to 100 with max possible method. Perceptual RI settings- Leave as default unless you know what you are doing. Print Test form for visual evaluation. Use qualified (Use ChromaChecker Lighting Inspector to qualify your booth) D50 Viewing booth to compare with master proof. Why reduce the optimization of data (smoothness)? Data optimization (smoothness) is good for high-speed production devices with some natural variation- e.g. offset presses. While devices that are very consistent (not as much natural variation) like inkjet proofing devices, turning on smoothness will reduce profile accuracy, which you do not want. 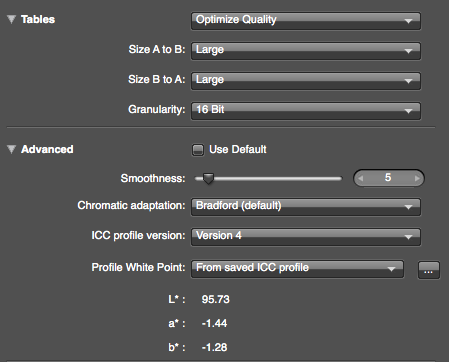 The more consistent and stable the device the more you do NOT want to use smoothness in the profile creation software. Below a comparison made between two profiles created from the same measurement file (CxF file). Solid shape (optimized profile) is smooth but unoptimized (red wireframe) is not. In the real world data measured from inkjet prints are not smooth.